Over here at Ardent Camper, we're a fan of camping and related activities. Granted, we're biased, but since you're here, we imagine you're biased too. Camping at a national park comes with some extra considerations. These federally protected lands are here for our enjoyment, yes, but they're also a conservation effort, designed to minimize people's impact on wildlife and terrain. Green camping principles are always in place at a national park — although they should be practiced everywhere. 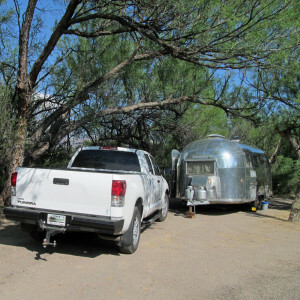 Located in the massive Chihuahuan Desert, Big Bend National Park requires campers to follow some specific guidelines, and that they prepare ahead. The environment is gorgeous but unforgiving, and at the same time, it is a delicate national treasure that must be treated well. Are you a car camper? A backpacker? An RVer? Big Bend has a variety of campsites that are perfect for any group, but it's best to know what's available before you arrive. If your ideal campsite includes a bed and air conditioning, you won't be disappointed! Book one of the 72 rooms at the Chisos Mountains Lodge for all the amenities you'd expect from a motel or hotel. There are also a few Roosevelt Stone Cottages, but these are especially popular, so book early. The lodge is a great place to stay for family groups or individuals with accessibility issues. It's close to an accessible trail that provides a beautiful view of the Window, a restaurant and store, and one of the only places in the park where wifi is available. Even though we didn't stay at the Lodge, we still took advantage of its amenities, like a soda machine and picnic tables. So that we wouldn't have to face the difficulty of dirty dishes in the desert, and so we could enjoy the beautiful sunset through the Window, we cooked dinner near the Lodge our first night at the park. If you're bringing your RV, campsites are available but limited. The Rio Grande Village campsite has full hookups for up to 25 RVs, and I overheard a ranger say these sites can be booked for solid weeks at a time. If you can score a spot, though, it's a lovely area, near some scenic vistas and a historic ranch and grove of cottonwood trees. There are other designated campsites that RVs can use within the Cottonwood and Rio Grande Village car campgrounds, so just make sure you call for availability first! Not everywhere in the park is accessible for large vehicles like RVs, so it's important to check if there's a place for you to stay before you make the long drive. 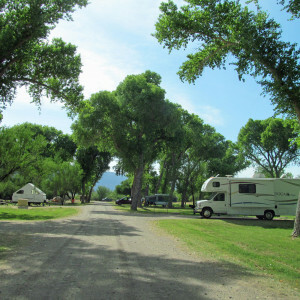 If you are looking for a car campground that can also accommodate some trailers and RVs, check out Cottonwood and Rio Grande Village Campgrounds. Both are near the Rio Grande and plenty of hiking and recreation. There are toilets and sinks (but only showers at the Rio Grande Village Store), dish washing stations, picnic areas and plenty of space for kids to run and play. The most stunning campground in the park is Chisos Basin. Surrounded by the towering peaks of the Chisos Mountains and with an unparallelled view of the Window, this campground fills up fast. The road to the campground is extremely curvy and steep, so make sure you're comfortable with driving with your trailer if you're bringing one. Most visitors in the Basin seem to just use tents, though. The sites aren't large, and the parking is limited. 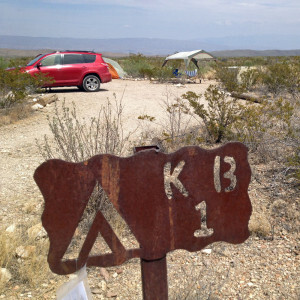 If you're bringing a big group to Big Bend, look into reserving one of the group campsites. These are located at Chisos Basin, Rio Grande Village and Cottonwood. You must make reservations at least four days in advance, so don't expect to waltz in and nab it, even if it's free. 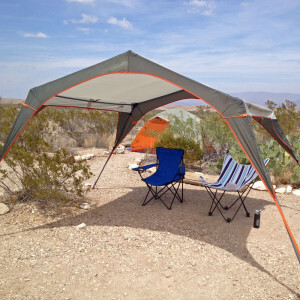 If you feel like an off-roading adventure, if you want some privacy, or if all the campsites at the three main campgrounds are already taken, you may want to consider primitive car camping at Big Bend. You'll need a backcountry pass to snag one of these sites scattered throughout the park, so when you talk with the rangers to arrange this, make sure you let them know what kind of car you drive. If you're in a sedan or a vehicle without four wheel drive, many of the sites will be impossible to reach. Even if you do get a relatively accessible assignment, you'll have to take a bumpy gravel road to reach your new home away from home, so buckle up! All primitive car campsites have a bear box, which you should use to store your food, trash and all other smelly items. You can also use your car for this purpose. 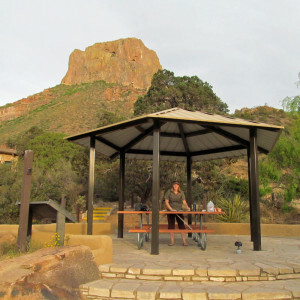 Backpackers will not be disappointed with the campsites available to them along the wide variety of trails at Big Bend. Obtain a backcountry pass from the rangers and let them know where you plan to stay. There are designated sites that are situated an adequate distance from the trail and road. Each is outfitted with a bear box you should definitely use. 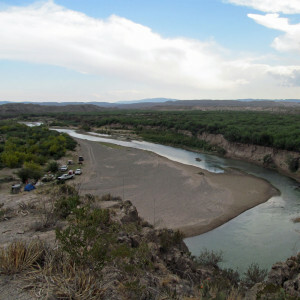 In the spring of 2013, Big Bend National Park opened Boquillas Crossing, a legal point of entry between the United States and Mexico, allowing park visitors to travel between Big Bend National Park and Parque Nacional Maderas del Carmen. Tickets can be purchased for the ferry that crosses the Rio Grande at the Rio Grande Village Store. Hours of operation are limited, so be sure to check in with rangers before you make your plans. Camping is available on the Mexican side of the river, so check in with park rangers to take advantage of these opportunities. The ferry only accommodates people, not cars, so you'll be limited to camping with what you can carry across the river. Bring a good backpack and all the items you'll need. Big Bend may be the 18th least visited national park in the U.S., but when Jessi from Outbound Adventurer and I showed up on Good Friday last week, many of the choice campgrounds were completely full. When planning a trip to Big Bend in the high season — November 15 through April 15 — call 877-444-6777 or visit www.recreation.gov well in advance to secure a spot. During the time frame above, some campsites in Chisos Basin and Rio Grande Village are reservable no less than four days in advance, but much of the year, it's first-come-first-serve. If you are planning to spend time in Big Bend during the first-come-first-serve season, make sure you arrive early. If it's a two-day weekend, try to arrive on Thursday. If it's a holiday weekend, really make sure you beat the rush. While at the Rio Grande Village Store, I watched an RV owner be turned away because there were no campsites available. Then again, she was arriving the Saturday before Easter, one of the busiest days at the park each year. It's doubtful she would have had success even if she had tried a couple of days earlier, but planning ahead is definitely key, either way. Big Bend National Park is located in a desert, so it's important to be prepared. See my packing list for starters. The non-negotiable items are water and water containers. Spigots are available at the park, but water is a precious resource, so if you can bring water from home, you'll be putting less of a strain on the delicate ecosystem at Big Bend. You may also want to consider a shade cover, your passport to cross into Mexico, a day pack for hiking trips, a container fuel stove as open fire is prohibited, and great walking shoes. If you're primitive camping, be sure to bring a trowel or bag for your waste. It is never a bad idea to bring a tent, even if you don't plan on tent camping. Tent sites may be all that are left when you arrive, and you don't want to have to sleep in the car or leave the park altogether! There's a lot to see from the road at Big Bend, but another consideration is make sure you keep your tank full. There are two gas stations in the park — one near Panther Junction right in the middle and the other at Rio Grande Village Store — but prices aren't cheap! Keep your eye on the gas meter so the rangers don't have to come rescue you. On another note, if you're a dog owner like me, you're tempted to bring your pup with you everywhere outside. I'm not going to say you shouldn't bring your dog to Big Bend, but I wouldn't. Dogs are only allowed to go where cars are allowed to go — which means no trails. It's also often far too hot to leave your dog in the car, even with the windows down, so that means someone needs to stay behind with the dog while others hike. Familiarize yourself with all rules before bringing your dog with you to Big Bend. For more general information about camping with dogs, read on here. 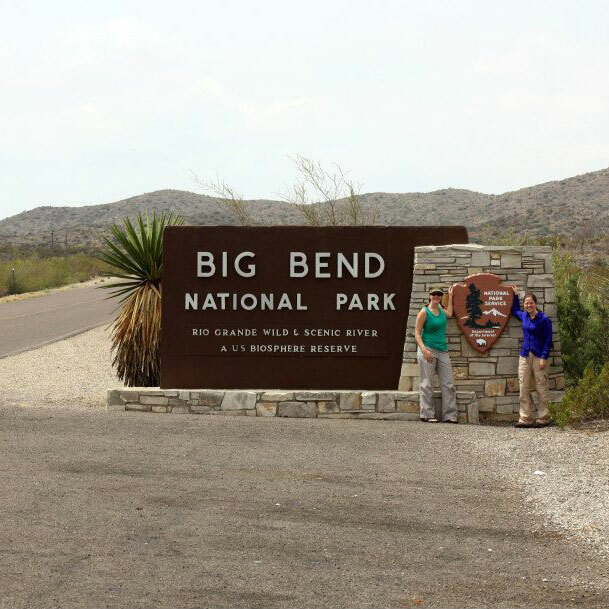 Have you been to Big Bend National Park and have some additional camping tips to share? Any questions? Let me know in the comments.